To play Blu-ray movies, we needs a smart HD TV via a Blu-ray player. It is very cool to enjoy HD Blu-ray movies on large screen at home. But some of you may would like to transfer Blu-ray to your favorite mobile devices such as iPhone, iPad, Android smartphone and so on. And someone just simply want to convert Blu-ray to common video formats on Mac or Windows for watching. No matter which goal you want to get, you need to ask Blu-ray ripper for help. For your great convenience, I'd like to suggest you utilize a Blu-ray to MP4 converter to rip Blu-ray to MP4 because MP4 is really compatible with various media players, video editing apps, online video websites, etc. This post is going to make a review of 2017 top 5 Blu-ray to MP4 converter softwares. After carefully read, you can choose the best Blu-ray to MP4 converter for yourself. 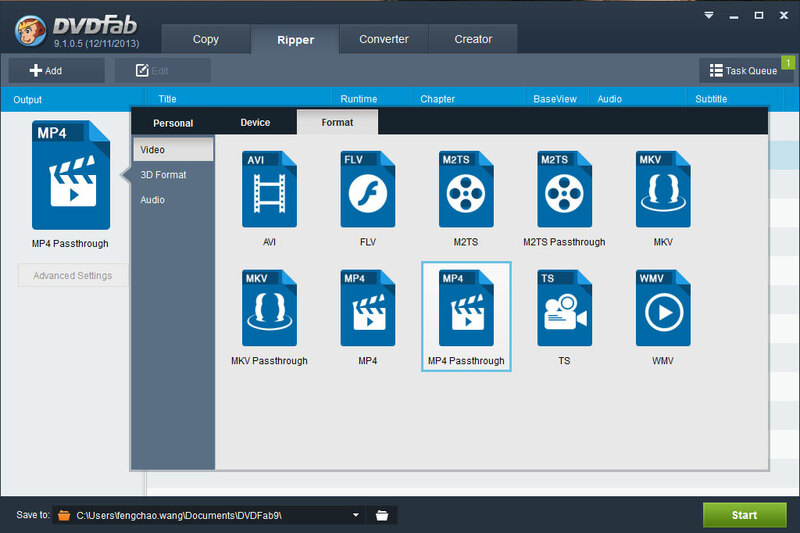 Part 2: Top Blu-ray to MP4 Converter Software: What To Look For? As we all know, Blu-ray discs are very easy to be scratched by naughty children and destroyed by too much times of playing in Blu-ray player. After ripping and converting Blu-ray to MP4, you can store your Blu-ray discs in loft for a good protection. The aim of copy protections is to prevent unauthorized access to the Blu-ray Disc, but when we paid and got the Blu-ray Disc as own property, it is quite necessary to have a good backup for the Blu-ray discs. With the Blu-ray to MP4 converter, you can easily remove various copy protection, including AACS Encryption, BD+ Protection, Region Codes, etc. from Blu-ray discs and then freely copy the content inside. MP4 is one of the best acceptable video format on multi-media portable devices, such as iPhone 8, iPhone 7, new iPad (2017), Samsung Galaxy S8/S8 Plus, etc, By ripping Blu-ray to MP4, you can play and watch Blu-ray movie wherever you like. 4. Stream all Blu-ray movies to Plex, NAS, Chromecast, Apple TV, etc. You can stream ripped Blu-ray to Plex, NAS, Google Chromecast, Amazon Cloud Drive‎, etc for TV viewing without specific Blu-ray drive. For these benefits, the Blu-ray to MP4 converter is really useful and necessary for you. However, there are a large amount of Blu-ray to MP4 Converter Softwares on the market, which one is the best? How to find a best Blu-ray to MP4 converter? The next part will give you some detailed criterions to make a best choice. The best Blu-ray to MP4 have a wide array of features and tools that allow you to rip, convert, edit and more. Below are detailed criterions by which we rated and ranked these Blu-ray to MP4 converter softwares. A powerful Blu-ray to MP4 converter software should have the ability to crack all Blu-ray encryption, then the tool will make a clean copy of the entire disc with all the copy protection removed. Not everyone is a technician. So, a perfect Blu-ray to MP4 converter should be relatively easy to use. We evaluated how easy it is to access and use the common features of each software. When you are making a copy of a Blu Ray disc you want to be sure that you retain the same video and audio quality found on the original Blu-ray discs. The top 5 Blu-ray to MP4 converter softwares listed in our post all generate a media file from Blu-ray discs with a high quality. A best Blu-ray to MP4 converter can not only rip Blu-ray to MP4, but also support other output formats. So, when we need a MOV file from Blu-ray discs, we will have no need to find a specific Blu-ray to MOV converter software. This criterion evaluates the versatility of the output file format offered by each Blu-ray to MP4 converetr. Speed is very important when it comes to ripping and backing up Blu Ray discs. No one likes to wait for a long time around computer while ripping Blu-ray to MP4. So the best Blu-ray ripper software will be optimized to use conversion acceleration technology. No matter how easy a software is to use, occasionally some customers need support. Manufacturers that provide excellent customer service make the best Blu-ray to MP4 converter. This service comes in the form of tutorials, FAQs and knowledgebase on their websites. If you can't get an answer in those ways, manufacturers should offer email or social support, like Facebook, Twitter, Google plus, etc. Plus, there are constant changes to copy protection schemes and the software must offer constant update service for free. Pavtube ByteCopy can rip any commercial Blu-ray, DVD to SD MP4, HD MP4, 3D MP4, 4K MP4, etc. 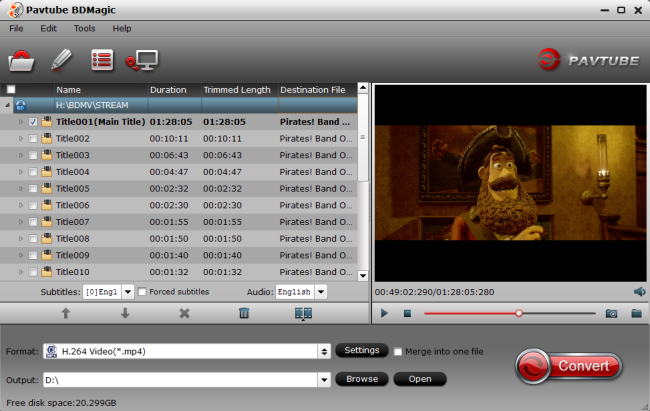 It also support converting Blu-ray to multi-track MP4 to keep multiple subtitle/audio track. This program is not only a best Blu-ray/ DVD to MP4 converter, but also a best video converter, which support more than 200 video/audio formats. It has some built-in video editing function that allows you to extract/add subtitle, add watermark, extract audio, trim, crop, split, merge Blu-ray, adjust Blu-ray movie aspect ratio, etc. BDMagic is another best Blu-ray to MP4 converter software from Pavtube. This software provides the same functions as Pavtube ByteCopy, except exporting MP4/MOV with multi-audio track and Lossless MKV(with multi-audio tracks/chapter markers). Similar to Pavtube ByteCopy, it provides regular update to adapt to the newest Blu-ray copy protection and I haven't found any copy protaction that can't be handled by Pavtube. Leawo Blu-ray Ripper comes with the popular feature to convert 2D to 3D for users to enjoy the popular 3D effect and exports various HD and popular common video formats, including MP4. The only drawback of this Blu-ray to MP4 converter is that it not recognizing Blu-ray ISO or forced subtitle (if there is) and GPU encoding is restricted to Nvidia's CUDA only while Pavtube is using Nvidia CUDA technology and AMD Accelerated Parallel Processing (APP). 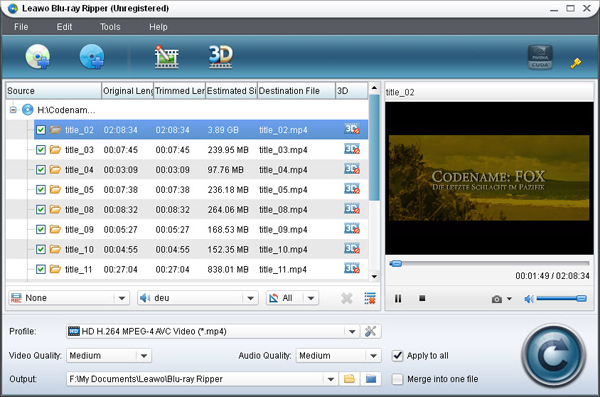 DVDFab Blu-ray Ripper is a software solution that enables you to rip the contents of a Blu-ray disc to your computer. It has only few digital formats to output but it can convert Blu-ray to MP4 format. DVDFab Blu-ray Ripper well deserves its high reputation in decryption, and it handles not only AACS, BD+, Region code restriction, but also Cinavia protected Blu-rays. 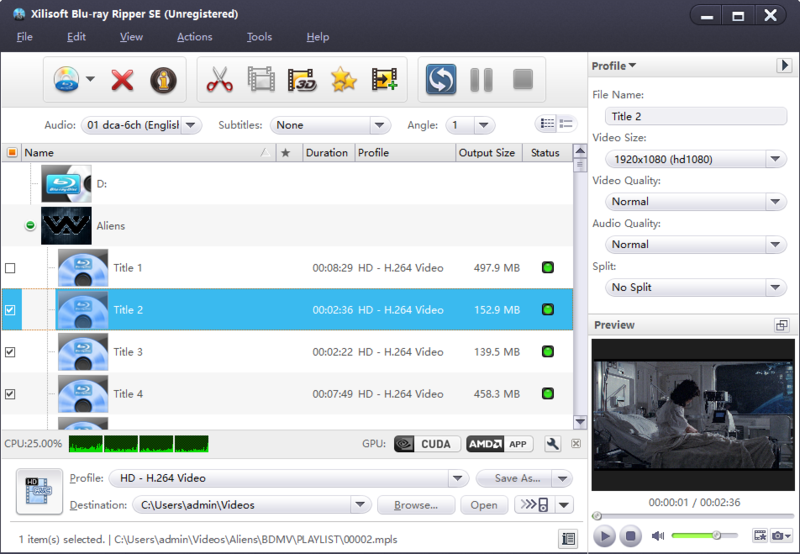 This Blu-ray to MP4 converter is taking advantage of CUDA accelerating, the conversion time is greatly shorted. With Xilisoft Blu-ray to MP4 converter, you can convert standard Blu-ray videos (M2TS format) and 3D Blu-ray videos (SSIF) to High-Definition formats or even 3D (H.264/MPEG-4 AVC, Apple TV h.264 720P, HD WMV, MPEG-2/MPEG-4 TS HD Video) with excellent and unmatchable conversion speed while preserving good quality. Pavtube ByteCopy is the best all-in-one software for Blu-ray ripping into MP4 or other various formats. We definitely feel the predominant advantages the software offers far exceed its apparent downfalls of moderate conversion speed and deficient technical support. No software is entirely perfect, but with superior features and high-quality video output, Pavtube ByteCopy comes close and is without question the clear choice to convert Blu-ray to MP4 and other HD and common video formats.